Note to self: Order this instead of lunch, not after lunch. I used to have a lot of KDD mixed softees (vanilla and chocolate) usually at their Shuwaikh outlet. Love that extra crunchy cone too. At their city outlet which is just next door, I’ve only been trying out the ice cream bars usually after lunch. 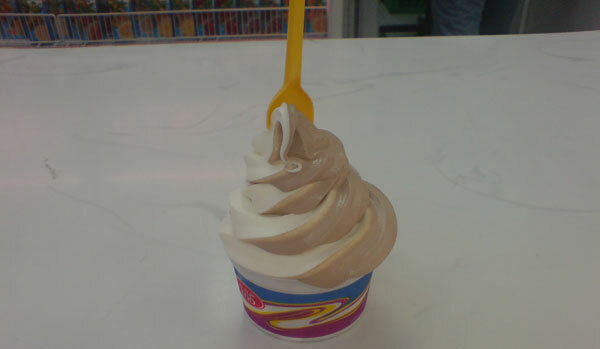 Didn’t realise they served the softee in a cup till I saw some school kids order them. 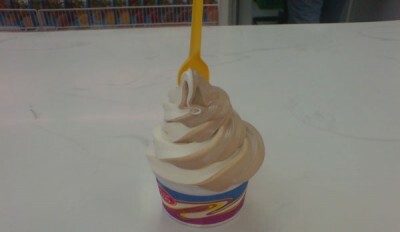 Now this picture doesn’t do much justice, but that is a huge softee in a huge cup. Worth the last fil you paid for it and can take the place of lunch in my case (small eater and all that).